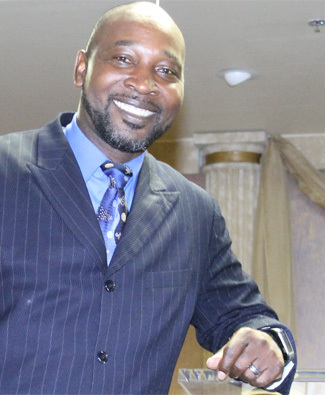 A powerful man of faith, courage, and wisdom, Bishop Antonio C. Richardson provides headship to New Life Evangelistic Center (NLEC) and Word Connection Ministries, International (WCMI), both headquartered in Jacksonville, Florida. An earnest preacher since age 16, Bishop Richardson has selflessly dedicated the majority of his life to the advancement of the kingdom of God. He has led NLEC from its inception as a small and meager ministry in 1993; to the multi-dimensional, influential and resourceful powerhouse it is today. Under his leadership, NLEC was selected as one of the Top 100 Churches in America in Technology and Innovation by Church Business Magazine. In 2013, the church added more than 300 new members as a result of a Spirit-led evangelism campaign vigorously spearheaded by Bishop Richardson and his wife, our distinctive First Lady, Dr. Cynthia McGahee-Richardson. A noted teacher and scholar of the Word; ever yearning for a deeper relationship and illumination of the things of God, Bishop Richardson is a recurrent on Trinity Broadcast Network, multiple radio broadcasts, and countless Conferences and Conventions. He has a passion for souls, true heart of a Pastor and the innate ability to bestow confidence to those who come in contact with him. He is a visionary. He cultivates leaders. Bishop Richardson institutes viable ministry programs that are life-changing and outward-reaching to the community and to the world. His influence reaches beyond NLEC as he oversees numerous churches in the Word Connection Ministries, International locally in the United States and as far away as Africa. Bishop Richardson holds a Bachelor's degree in Religious Education and a Master's degree in Theology from Liberty University. He also received an Honorary Doctorate of Divinity from St. Thomas Christian College.